Las Vegas, one of the most visited cities of the world, is a dream city by all means - for various reasons. Many go there to satisfy their craving for gambling, some for the night life, some to get married, others on official work and others to admire the wonderful grandeur of the city with its imposing hotels lining the Strip! No prizes for guessing which category I belong to! 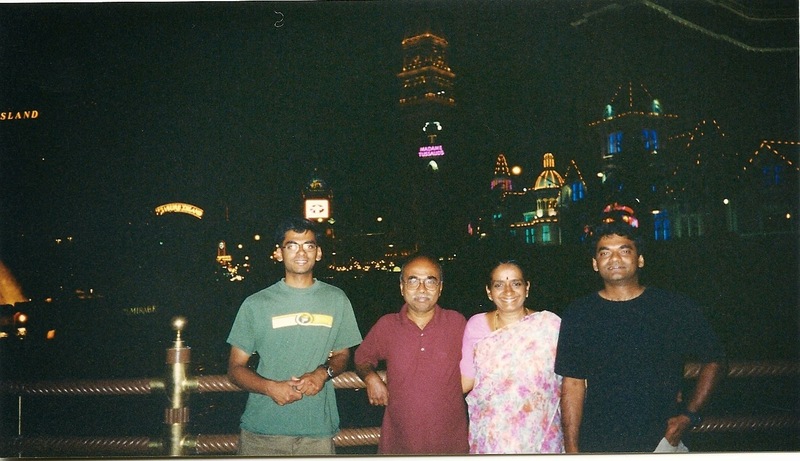 We had visited Las Vegas during our first visit to the US in 2000 when both our sons were students and I fell in love with it. 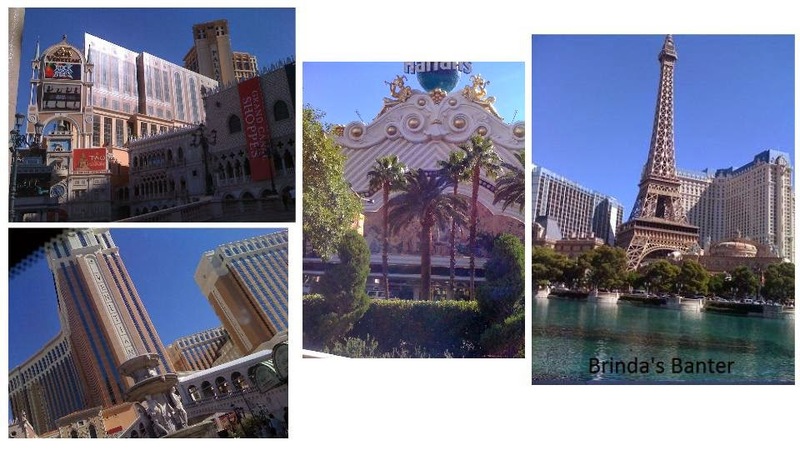 If at all I wanted to revisit any place it was undoubtedly Las Vegas! Different tourist spots found place in our itinerary during our subsequent visits. Vegas figured in our recent trip. To say that I was excited to revisit Vegas is an understatement. As we drove into the city of dazzling lights around 8 p.m. the city beckoned us with a colorful and glittering welcome. Our son had booked two rooms in the 'Venetian' for two nights. It felt great checking in at one of the biggest hotels in Las Vegas. Of course all the hotels along the Strip are imposing, awe-inspiring, grand and theme-based. As we entered the reception area of the Venetian to complete the formalities before check-in, the grand paintings on the roof took my breath away. Soon we were winding our way through the crowd towards the elevator. We had to show our room keys to get past the security guard seated there. We were soon in our rooms - both the rooms were inter-connected. A nice, large, cozy room. As I went towards the large windows to check out the view, the blinds opened as if on cue! Surprised, I turned behind only to see my son smiling - with a remote in hand! How cool was that - operating the blinds with a remote even as you are relaxing on your bed! Next I was looking for a microwave but was disappointed not to find one! Come on, who will want a microwave (except a middle class 'desi' mom) while holidaying for a couple of days in Vegas! Next I opened the fridge to put in the few juice-boxes we had. But there was no scope for putting them in as the fridge was already loaded with snacks and drinks. No sir, not complimentary! In fact my son had already warned us not to unload anything from the fridge. Even if you took out a juice can out of curiosity, the decrease in weight would bee registered and you'd be charged for the item. During an earlier visit, my son had had such an experience - he had put back the can but he had already been billed for it. When he scrutinized the bill during check-out, he noticed it, and explained to the officials and they were obliging. Any calculative person would opt for vending machines rather than the over-priced hotel-room-fridge drinks. Suddenly we saw gondolas and for a moment seemed to be transported to Venice! The kids were excited to see the man singing as he was ferrying his boat with a couple on board. And there were quite a few of them. We soon seemed to be on the streets of Venice - the cute villas and balconies seemed real! I expected Romeo and Juliet to pop to life! The sky was a light romantic blue and it seemed to be twilight though it was well past 9 p.m. It was because of the special lighting - there was no nightfall there! Soon we walked towards St.Mark's Square and we had a feast awaiting us - a musical feast - a lady on the flute and two men on a guitar and a violin were belting out melodious numbers. We sat and enjoyed a couple of songs. As we were ready to leave, they started playing another song .... and it rooted us to our seats. I took out my camera and took a video of a part of the song. Wasn't I thrilled to listen to 'mera jootha hai japaani' out there in Las Vegas! Ooh, I had goose bumps. That made my day, I tell you! Our sons were Grad students then and they took us on a road trip from Colorado to Nevada, San Francisco, Los Angeles, San Diego, Las Vegas and Grand Canyon. We reached Vegas around 7 on a Saturday night. I was totally bowled over by the illuminated city dotted with huge hotels with dazzling lights. There was a small debate between the boys about where to check in. The elder one voted for one of the majestic hotels but the younger one opted for a motel. We let them sort it out. On inquiry, we found that 'New York New York' had a couple of rooms for 120$ per day. But junior didn't give the nod. 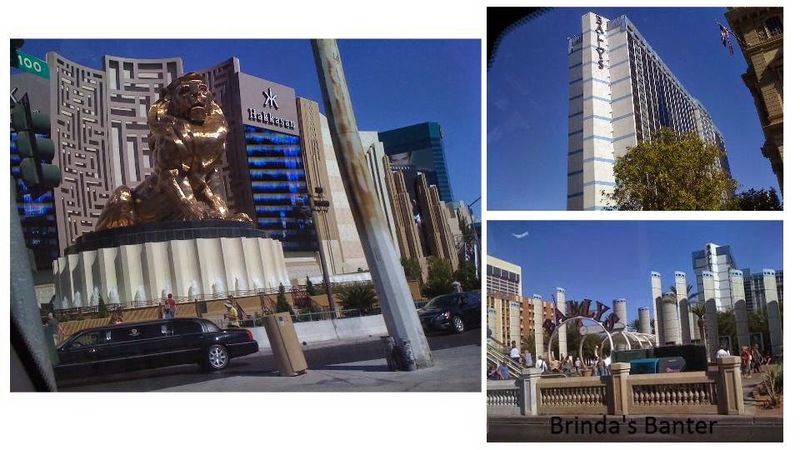 So we drove down the Strip, stopping by a couple of hotels for inquiry: rooms were expensive at 200$ per day. So they decided to get back to 'NY NY'. But within the last 25 minutes, the rates had been hiked to 200$ for the last few rooms remaining! The big bro chided his younger brother for missing out on the deal and quashing his desire to lounge in luxury and extravagance at least for a night. The younger one's argument was that we'd be in the hotel only for a few hours and that too - to sleep! We drove to the end of the Strip and checked in at Motel 6, had a quick dinner of sandwiches and ventured out at 9. 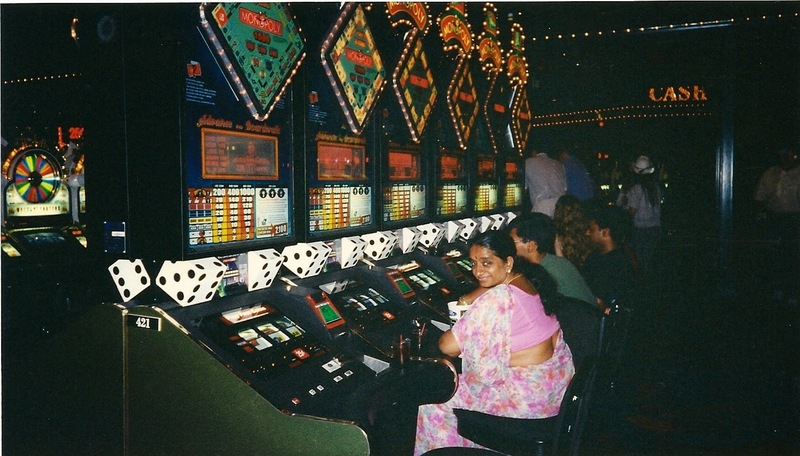 It was fun walking along the crowded Strip (me in a sari, mind you - those were the days!). We walked along gazing at the beautifully illuminated hotels, getting in, seating ourselves in front of slot machines, listening to the excitingly tempting jingle-jangle of coins resonating from all over. We were safe gamblers, so we chose to play at slot machines for 10 c/ 25 c. We won some and lost some but it was fun to collect the jingling coins dropping out from the machine in our plastic bowls! I don't know when I drifted off to sleep. When I woke up, my husband was preparing coffee. After our cuppa, we decided to explore the Venetian a bit on our own. 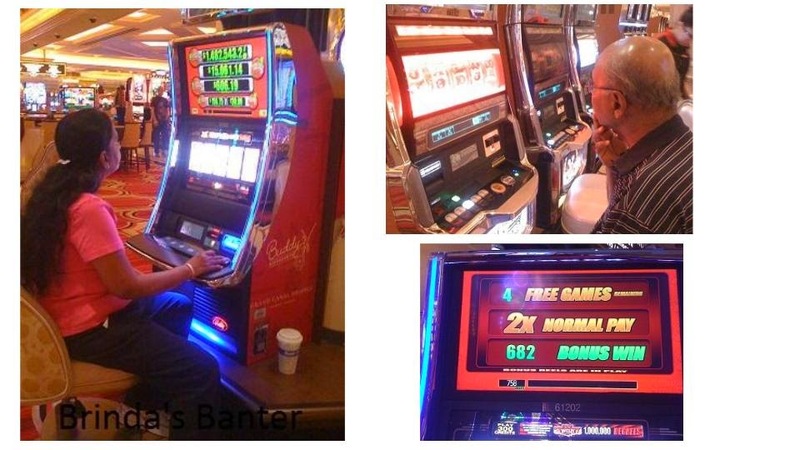 We had come equipped with coins and seated ourselves in front of a slot machine of our choice (25 c - what else?). We scrutinized it to find the slot for inserting coins. But we couldn't locate it! Instead we saw a sign, "Insert your bill here." We tried to put in a dollar bill (note) but it wasn't accepted. We checked out a few more slot machines and returned to our room disappointed. Our son explained that coins are no longer in use. We'd have to insert a neat dollar bill of the desired denomination and play as much as we wanted. We'd have to extricate our ticket for the balance amount while leaving a machine and use it at another machine of our choice or exchange it at the cash counter for money. I remembered how thrilled we were during our earlier visit when we scooped the coins raining from the slot machine with our hands into our plastic bowl. This was definitely less exciting in comparison - though the sound of jingling coins had been maintained for effect, the feel of the actual coins was really missing. Oh yes, it's become a virtual world! After breakfast at one of the eateries inside the hotel, we decided to explore the Strip in daylight before the sun was at its peak. 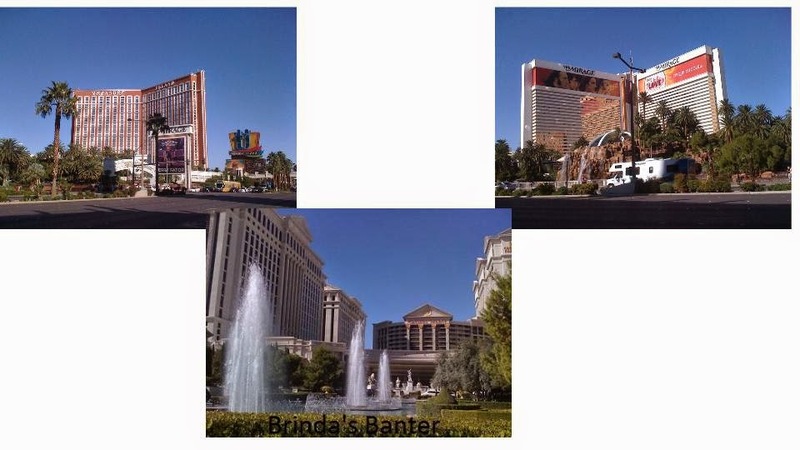 We admired the majestic exterior of Palazzo, Venetian, Harrah's and Paris on the left and Treasure Island, Mirage, Caesar's Palace and Bellagio on the right. It wasn't possible to explore each of these, so we chose one. 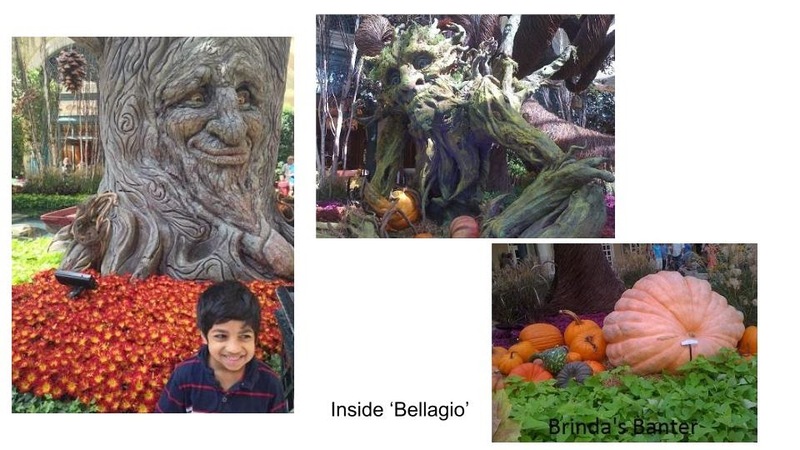 We went inside Bellagio and tried to compare its ambiance with our Venetian and the walked to their greenhouse where a flood of colors and flowers and vegetables greeted us. 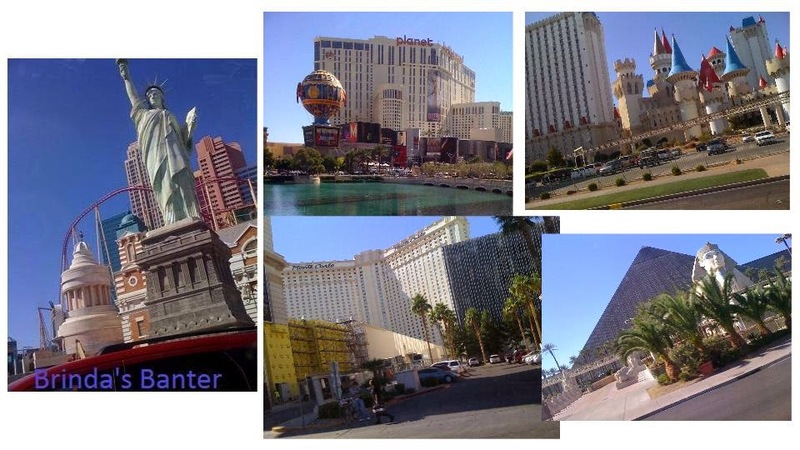 Then as we were returning, I could take pictures of the hotels on the other side - MGM, Bally's, and Paris, Harrah's, Venetian and Palazzo. Phew! Wasn't that cool? I had all of them captured in my camera within a matter of twenty minutes - an instant gratification! My day was made - yet again! Of course the thrill of walking down the Strip at night during our first visit was a totally different chew-n-enjoy experience! What we didn't manage to do on our earlier visit, we did this time. After buffet lunch at a nearby Indian restaurant, we visited Madame Tussaud's in the Venetian. The rest of the day was lined up with shows - first Mac King's magic show with the kids at Harrah's. Then the younger couple went for a show while the grand parents explored the hotel with the kids. Then it was time for our show - stand-up comedy by Ray Romano and Kevin James - both my favorites - I am a big fan of Raymond (Everybody Loves Raymond) and Doug (The King of Queens). The show was at 10 p.m. at Mirage - just across the road, opposite to The Venetian. We watched the 'Fire Show' outside Mirage before going to the auditorium. Need I say we thoroughly enjoyed it? After the show both of us satisfied our yearning to relive the experience of taking a short walk admiring the resplendent line of hotels at night. We hadn't gone around the entire hotel, so we explored the rest of the floors before check-out the next day. We followed the signs and landed on the fourth (or fifth floor - I don't remember which) to check out the crystal blue swimming pool and the beautiful trees and plants in the adjacent garden. Only when we took the elevator to go down to our room did it strike us that these marvels were not on ground level! Amazing! We were all set for checking out. Suddenly I realized that I hadn't clicked pictures of the ceiling that had fascinated me when we had entered the hotel. It was at the reception, so I followed my son when he went to settle the bill. Wow! Click, click, click went my fingers as I captured the paintings on the walls and ceiling in my camera. As we were leaving the hotel, I saw an Indian couple walk in with their parents. The daughter was clicking a photo of her sari-clad mother ( reminding me of my earlier visit) against a plain backdrop. I felt like telling them to get in for attractive backdrops adorning the length and breadth of the hotel!